A common scenario: You know what you want to pack, but no idea what to pack it in. We can present you with many options that will be both eye-catching, cost effective and secure for worry-free shipping. Retail packaging and presentation will ensure your kit isn’t just a selection of odds and ends. It will be a cohesive set that help you deliver the WOW-factor. Sometimes you want more than just a standard cardboard box. 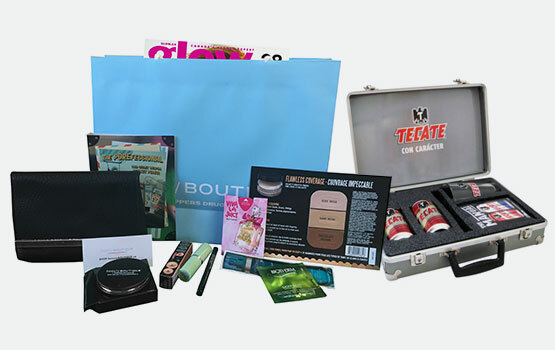 We can help you deliver a kit that is exciting and eye-catching, A custom package can make all the difference when presenting your products, sales and marketing kits. Your contents come first. Our custom packaging comes next. It’s not just a box or bag - it’s your identity. Gift Bags: paper, organzas, velvet, etc. Calculating packaging costs is often overlooked when budgeting for fulfillment. And materials can get expensive. Based on the high volume we ship, we have excellent pricing on cartons, envelopes, jiffy pages and filler material. Those savings are passed on to you.